... this book is a long-awaited and very welcome study on a fully regional basis. ... it has an open and readable style with a good balance of technical terminology and historical narrative, making it accessible to both specialist and generalist reader alike. ... this work is a masterful achievement, both learned and practical; a must-have for anyone with an interest in this fascinating topic. Mike Williams' book is able to bring that heritage vividly to life through a rich array of high quality photographs, both modern and archival, reproductions of contemporary prints, superb maps and technical drawings whic are liberally scattered throughout. 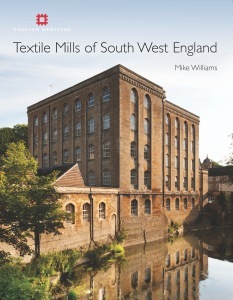 This beautifully-produced and highly informative volume marks a most welcome contribution to the study of the textile industries of the south west of England. ... one of a growing number of substantial, analytical studies by English Heritage which are characterised by rigorous field investigations and copious illustrations ... It is hard to find fault with such a thoughtful, thoroughly researched, well-written and beautifully presented volume. . ... It is less than sixty years since the term 'Industrial Archaeology' was first coined in print and this high-quality, detailed, yet accessible interdisciplinary study shows how the subject has already matured. The volume provides a rewarding read for all with an interest in industrial history or the landscape of the south west.